Remakes and re-releases of retro console games are ten a penny these days; there are countless old-school titles from the likes of Nintendo, Sega, SNK and Namco available for newer audiences to discover on modern platforms like the Switch. It’s uncommon, though, for home computer games – specifically those from the ZX Spectrum and Commodore 64 – to get the same treatment, which is why Saboteur! is such an interesting release. Created way back in 1985 by British programmer Clive Townsend, it was critically praised at the time, earning its fair share of high scores and accolades including ZX Spectrum magazine Crash’s prestigious 'Crash Smash' award. Now, a mere 33 years later, Townsend has released this remastered version, offering a longer adventure than before. Not everything that was great three decades ago holds up over time, though – Chris De Burgh’s Lady In Red is perfect proof of that – and Townsend’s decision to go for historical accuracy rather than a modern revamp means Saboteur! is a bit of a hard sell for gamers who didn’t experience it the first time around. Compared to the current day Metroidvanias, this is very much a cave painting; albeit a charming one that still has its fans. The concept is simple, at least at first. Playing as a highly skilled mercenary dressed as a ninja, you’ve been hired to infiltrate an enemy security building disguised as a warehouse and steal a disk containing the names of all the rebel leaders. You start off in the sea, approaching the building on a rubber dinghy – as is the ninja way – and must get in, steal the disk and leave via a helicopter on the roof before time runs out. There were three different ‘endings’ to Saboteur! back in the day and it’s the same situation here: you can either leave in the helicopter without retrieving the disk (which is basically failure), you can leave with the disk or you can go for the best ending: replacing the disk with a bomb hidden elsewhere in the building, and escaping before it blows the warehouse to matchsticks. It’s a basic idea, then, and the game is similarly simplistic as a result. Exploring the warehouse for the first few times will be an exercise in trial and error; there’s no in-game mapping system so unless you sit there with a pen and paper you’re going to have to just learn and memorise where each room is. Everything stays in the same place with each playthrough, though, meaning once you know the location of the bomb, the disk and the helicopter, you can have the game beaten in a couple of minutes. Well, sort of. You see, Townsend has added a new section onto the end of this version of Saboteur!, increasing the game’s map by what he states is around seven times (and that seems to be pretty much spot on). In the original game you’d fly off in your helicopter and that would be it, but this time you’re informed that there’s still a signal coming from the building and so the helicopter hilariously slowly lowers down again so you can hop back out. A quick dash to the right and a hop down and you’ll find a new elevator screen, which takes you out of the warehouse and into an entirely original area with various new buildings to explore. This new section of the game is handled well: it removes the countdown and gives you more time to explore, while also maintaining the feel of the original gameplay. There’s a lot more dialogue, too; you’re constantly chatting back and forth with another agent on a Metal Gear-style radio, although a lot of the chat consists of ‘clever’ 80s references that start to get a bit tenuous. Samantha Fox, Gremlins and Caramac bars are all given the nod, as is an arcade area with 8-bit renditions of Pac-Man and Space Invaders machines (which aren’t playable, before you get your hopes up). It isn’t perfect; some of the exploration can get a little repetitive and there’s one section made up of a number of laboratories that’s painfully tedious. Above all else, though, is one major issue that hangs over the entire experience like an oversized ‘80s perm: it still looks, plays and most importantly feels like a 33-year-old game. Saboteur! may have been a pioneering adventure game in 1985, but today its single-button control system and incredibly clunky movement only serve to frustrate. Back in the day, most joysticks only had one fire button, which was used here to punch. Moving the joystick up pulled off a jump kick, but that meant doing it in front of a ladder would have you climbing it instead. Similarly, when you were being chased by a guard dog and needed to get up a ladder quickly, you would often jump instead, landing on the dog and taking damage. Despite the Switch controllers having significantly more than one button, jump-kicks and ladder climbing are still mapped to one input. Combat is horrendous too: punching and jump-kicking enemies while they try to do the same feels like fighting underwater until you realise that standing in just the right place and pulling off the right move (jump kicks for guards, punches for other ninjas) generally gets the job done right away. Meanwhile, picking up objects is immensely frustrating: they’re all invisible so you don’t know there’s one there unless you’re standing on more or less the exact pixel where it’s located, meaning most of the time you’ll run past it, run back to see what it was, then inch yourself back and forth to try and pick it up. 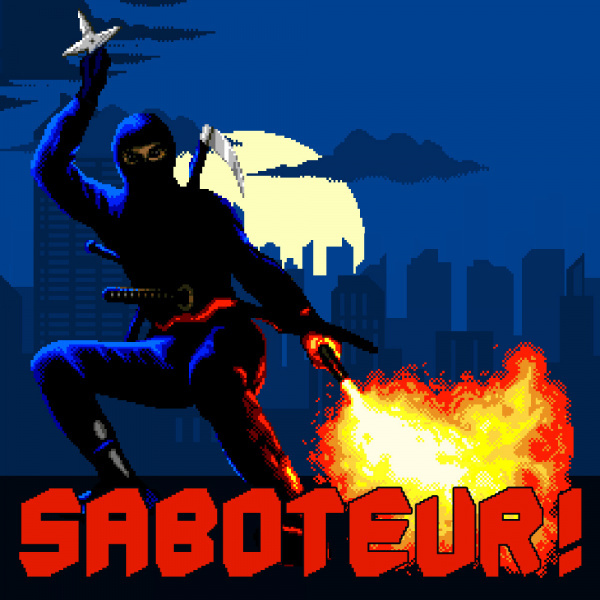 One very nice touch, however, is the addition of special graphics filters designed to imitate how Saboteur! would have looked on other systems it wasn’t originally released for. 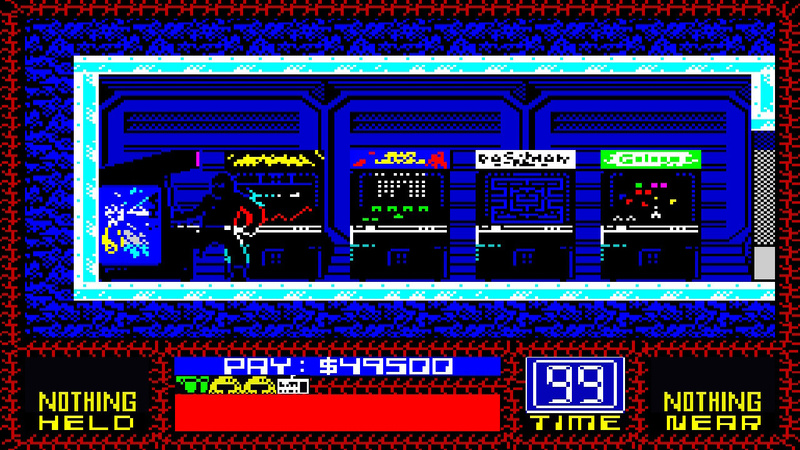 When the game originally boots you get to choose between Commodore 64 and ZX Spectrum graphics – since those were the two systems most people played the game on – but as you explore the warehouse and new areas you’ll come across pairs of goggles which unlock new filters. Some of these seem to just be there for comic effect: the incredibly basic ZX81 filter with its ASCII art and the Atari 2600 filter with its blocky sprites will get a laugh, but they're practically unplayable. Others are just fun: the Game Boy and NES filters are impressively accurate and look just how you would have expected ports of the game to look on those systems back in the day (minus things like flicker and slowdown). By far the best, however, is the Amiga 500 filter, which really feels like a proper visual upgrade and adds loads of new details to the character sprites and backgrounds. What this feature gives with one hand, though, it takes away with the other. Not only do you apparently have to unlock these by finding the goggles dotted around (we say ‘apparently’ because they were all unlocked from the start when we played, which we assume is a bug), but they only work in the opening warehouse section - i.e. the first five minutes of gameplay. Once you descend in the helicopter again and take on the new, much larger part of the game, you’re stuck choosing between ZX Spectrum and Commodore 64 graphics again. This is massively disappointing and can presumably only be explained by a lack of effort to create backgrounds in the new styles. We’d have loved to play through the entire game with Amiga graphics, not just the bit that now essentially acts like a prologue. Saboteur! has charm to an extent. If you’re old enough to remember the microcomputer era that dominated the UK in the early ‘80s, this will sweep waves of nostalgia over you with its authentically rubbish graphics. Anyone open-minded enough to appreciate that most older games aren’t as intuitive or control as well as modern titles will also get some enjoyment out of it. For the most part, though it’s a disappointment; a game that revisits a once-classic title and expands on it in some ways (the game map), but remains stubbornly insistent on not improving it in others (the controls) or doesn’t go far enough (the graphics filters). Anyone who fondly remembers the original Saboteur! will get enough out of this Switch release to scratch a nostalgic itch. Everyone else will be frustrated by its archaic controls, the half-hearted way it offers it graphical filters and the general clunkiness that comes with a 33-year-old Spectrum game. That it costs £6.29 / $8.00 on Switch but only £2.39 on Android and 99p on iOS merely adds insult to irritation. Oh, I was hoping to add it to my collection, and while I've bought games that people consider didn't age well, I'm talking about 6/10 scores maybe (ACA Double Dragon). 4/10 seems too bad to be enjoyable. Are scores ever going bellow 4 here anyway ? Nice review of a pretty bad game. Not all 30 year old games can hold up today I guess. If this were a remake dair enough. But seven pounds or whatever it is for a 30 year old spectrum game is an utter joke. How was it even passed. I remember buying this for my ZX Spectrum... all those years ago. I used to really enjoy playing it, especially the shrunken throwing stage. @Kit ... sorry, I think you are mistaking this for Shinobi. I did play Sabotour too. Nostalgia can only take me as far back as the 16 bit era with a few 8 bit exceptions. I enjoyed this as a kid back in the 80's but have no desire to play it again. Watching old games on YouTube is enough nostalgia for me. The only one I've ever played again and been worth it was Lemmings. Now that was a great game that still holds up well today. I go to The Messenger and Mark of the Ninja for my ninja action. I'm actually chuffed this is on switch. Really hope we see more 8 bit software from the speccy and c64. Honestly, I would pay good money for a Switch cart filled with Commodore 64 classics. It'll never happen, of course, because securing all the rights would be a nightmare. Wouldn't it be better if we could just have a Spectrum emulator for the Switch?!! @Mountain_Man You can always get the C64 Mini. I do think it's a little on the pricey side ($80/£70). It comes with 64 games, but it's a rather mixed bag. As much as I love the C64, I think the NES and SNES mini are a much better deal. The one thing the C64 mini does have is the option to play more games from a flash drive. Oh, and someone also recently announced the PC mini... No games have been announced for it yet since they have yet to start the fundraising and get licenses for games. As far as this game is concerned, I enjoyed it, but there's plenty of C64 titles which I'd rather play with new levels. @steve_1978 Hell yes! Lemmings is so fun. The best version I have is on PS3. It would so good if that version would be ported to Switch along with a graphically updated version of Lemmings 3D(a PS one game I enjoyed quite a bit). @OfNullAndVoid Except I don't just want to play Commodore 64 games (which I can already do on PC with VICE), I want to play Commodore 64 games on my Switch. I always thought Saboteur was over hyped and the end product was decidedly average. So it's not surprising an old average game hasn't aged well. Id rather see games like Navy Seals, The Great Escape, Platoon or Into the Eagles Nest revisited. On a random note, I have memories of a c64 game that involved an army boot camp and obstacle courses that I think may have been Full Metal Jacket. Anyone remember that game? This review has sold it to me. Exactly what I wanted to hear. Those graphics for the ninja have been hypnotizing me since I saw this on the e-shop. The way the outline colour changes based on what's behind him... Yeah maybe this is just some kind of palette limitation but it makes him look like a crazy chameleon super-ninja. Why is there any combat in the game at all when surely nobody can see him! A shame, but having recently replayered a lot of old Speccy / Nes / Amiga etc games I'm rapidly finding out nostalgia isn't what it used to be. My favorite Speccy game was Bak 2 Skool but it took a conceted effort like Bully to do it justice. Yep that's it, well remembered. 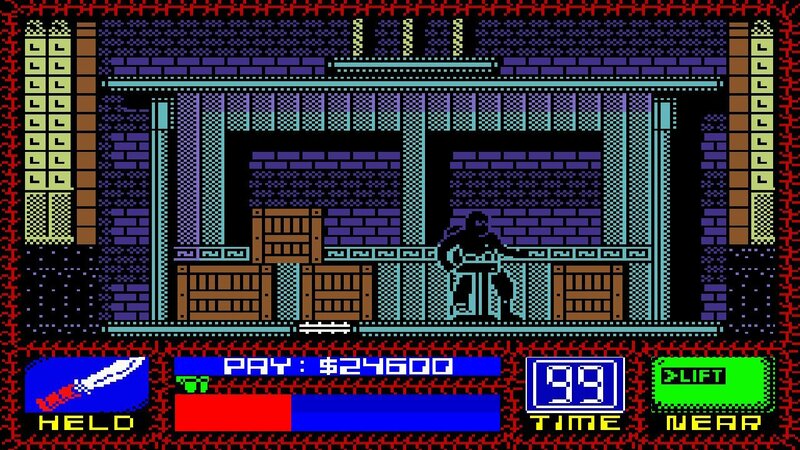 If I get a C64 mini Id like to revisit some of the more obscure games such as that and Killed Until Dead. If I can find them. My favorite C64 games were Paradroid and Defender of the Crown. I still play them to this day, although the Android versions on my phone are nowhere near as good as the C64 originals. Leave Lady in Red alone you monster! Apparently version 1.0.2 just came out. Can anyone confirm if this adds the graphics modes to the additional content? Bought this for 94p, really, really enjoying it, looking forward to Saboteur 2 and 3 now.